Under the Navodhya education project each education zone in the island is provided with ‘Lighthouse Resource Room’. Trincomalee Methodist Girls' College has been selected for the Trincomalee education zone. Ms F.Iqbal, Trincomalee zone Assistant Director of Education (English) lighting the traditional oil lamp. 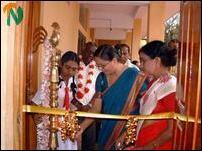 The school Principal Ms Urohini Jothinathan is on her right. Mr. Gunatilake said that there were 397 Navodhaya schools coming under the direct supervision of the Central Ministry of Education. Of them 22 have been selected best in the island. Trincomalee Methodist Girls' College is one of the 22, he said. About 9000 schools are in the country. Only about nine hundred schools are administered by the central ministry of education. Of them 324 are national schools, 397 Navodhaya schools and 54 Primary Vidiyalayam, said Mr. Gunatilake. Mr.F.Iqbal, Assistant Director of Education (English language) said the center would uplift the standard of English language of students in Trincomalee. School Development Society Secretary Mr.G.Kailayanathan outlined the urgent needs of the school. Trincomalee Zonal Director of Education Mr.K.Thilakaretnam and Divisional Educational Officer Mr.N.Chandrakanthan participated in the event. 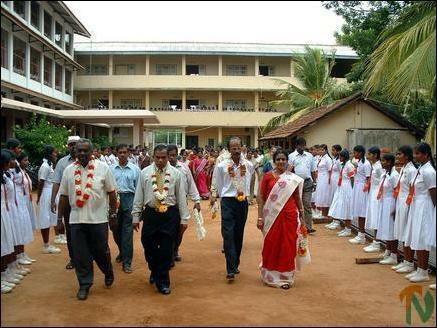 Director Mr.Gunatilake (second from left with garland) being taken to the Lighthouse Resource Centre accompanied by ( L-R ) Trincomalee Zonal Director of Education Mr.K.Thilakaretnam, School Development Secretary Mr.G.Kailayanathan and College Principal Ms Urohini Jothinathan.